In my view, crude oil is making a bottom. It's a complicated bottom. We will look back someday and say, in 2014-2018 crude oil made its bottom. Known reserves of oil everywhere continue to decline except for fracking but the fracking bubble burst a few years ago. Now people know that fracking is not magic and that people can lose money in fracking. I repeat what I said about IBM and computers, the people who invent something do not necessarily become the ones who succeed but we do you that the world has a money problem. The agriculture sector has been a disaster for 35 years. Things are so bad. The average age of an American farmer is 58, the average age in Japan is 68. And do you know that the highest suicide rate in the UK is in the agricultural sector? 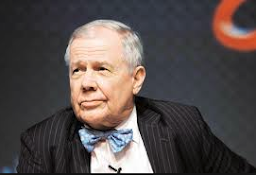 In this short video interview Jim Rogers discusses the futures of Bitcoin, internet and money. "I repeat what I said about IBM and computers, the people who invent something do not necessarily become the ones who succeed. We do you that the world has a money problem." "There will be an imbalance in the future between demand and supply in agricultural commodities… and that will drive prices higher." Jim Rogers shares his views on money, cryptocurrencies and Bitcoin. In the past when America has given tax incentives to bring US Dollars home it has made the US Dollar go higher, certainly for a while. These tax laws have just changed and there are now incentives to bring US Dollars home. I suspect they people will bring the US Dollars home and I suspect the US Dollar will go higher especially as interest rates go higher. I am still buying shares in Asia. China is down 40 percent from its all time highs, Japan is down 50 percent from its all time highs. The Japanese governent is doing everything it can to get stocks up.